Is the internet really dying? I’ve recently been sent multiple links to articles about the world wide web being dead and Google falling so as usual I decided to look for myself, partly because I’m curious and also because after all I build websites for a living so it would have been good to know if it was time to look for a new line of work (maybe get my chance at making donuts for a living). First I looked at the rumor that the world wide web was shrinking obviously the best way to check if it is true is look at the total internet page numbers. 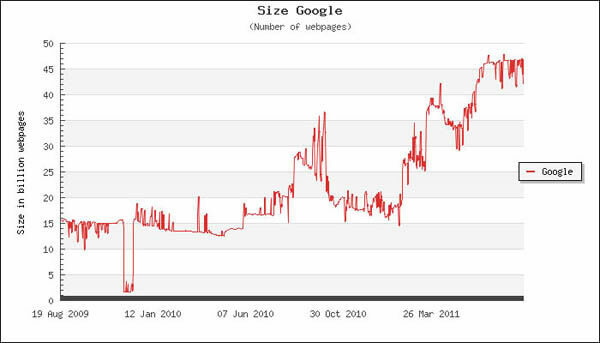 Best place to look is the Google total indexed pages, Google basically copies every page they find on the internet, here are their pages for the last few years. …well I’m no expert but it doesn’t seem to be quite shrinking, does it? Let me put it more bluntly, if this graph represented my weight on a scale I wouldn’t think I was shrinking, I would think I was getting fat; now I do know someone out there will say something about being overweight and health risks and although I fully agree with you I don’t quite think that applies to the internet. 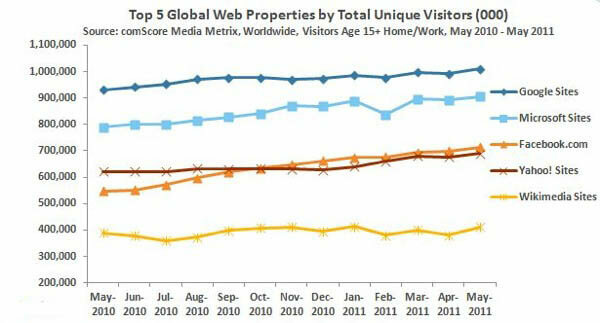 Look Google just hit their highest number of monthly unique visitors at over 1 billion a month. Huh… 1 bbbbiiilllion??? That sounds like a big number; if 1 billion people were to visit you and it took you 3 seconds to say hello to one it would take 100 years to say hello to all of them (and that’s without sleep). I guess you might be asking yourself why you would say hello to 1 billion people and that would probably be a good question but I think I’ve gone off the point again. So let’s review what we have learned so far; the internet is not shrinking it is expanding, Google and search engines are not losing customers, they are getting more customers. So what it really happening? Very simple, people are spending more time doing two activities on the internet; watching videos and networking with each other. Why are people spending more time watching videos and networking? Duh, because they can. Just a few years ago watching a video or movie online was not something anyone would do. For one the connection speed themselves made it impossible to provide any decent quality without the video constantly stopping. So what we actually have happening is a shift on the amount of time spent doing actions online with movies and networking being preferred to still web pages. This brings us to the final question; if the internet is not dying and Google is not shrinking then why is someone saying they are? …that, my friend, is the right question.